Bespaar $22.00 door nu voor die optie te kiezen. 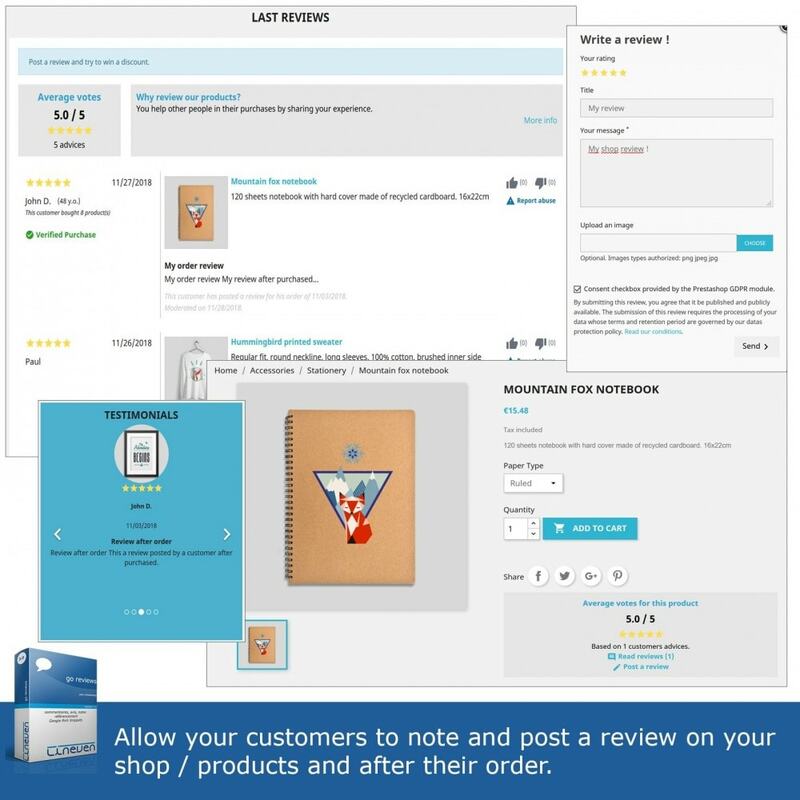 Allow your customers to post a review on your shop / products and after their order. Enable the Google Rich Snippet to improve the SEO of your shop in the Google search engines. For a visitor, it is much easier to buy if a trust is established. This trust can be created through the advices written by others customers to share their opinions. With Google Rich Snippets, improve your results in the search engine Google and increase your click through rate, your number of visitors and your sales! Go ahead and increase your sales by allowing your customers to share their experience. 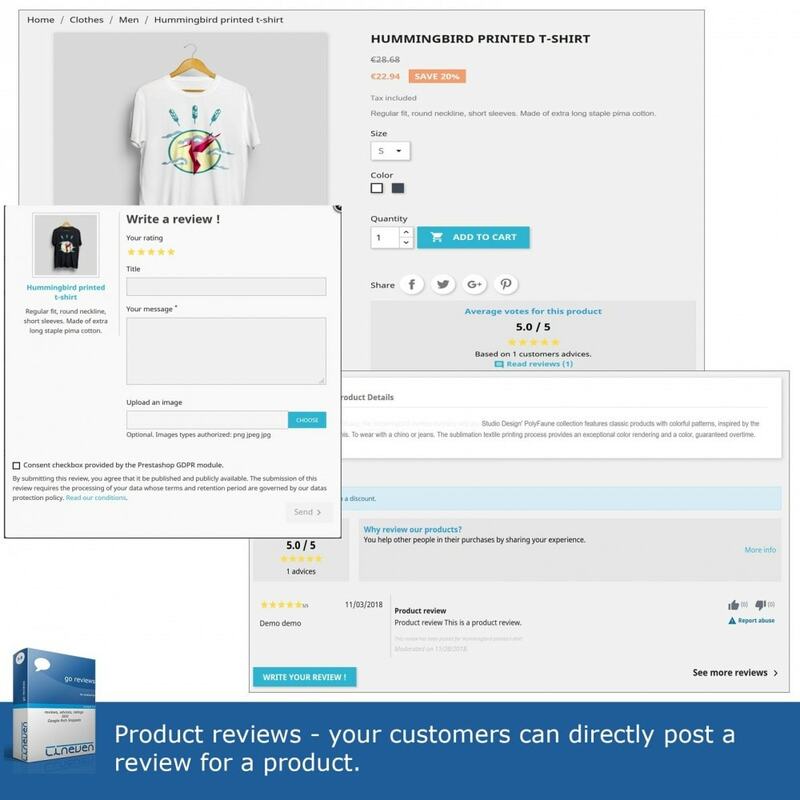 Your customers will have the opportunity to rate and post reviews on your store, on your products and following their orders. - In the customer account. 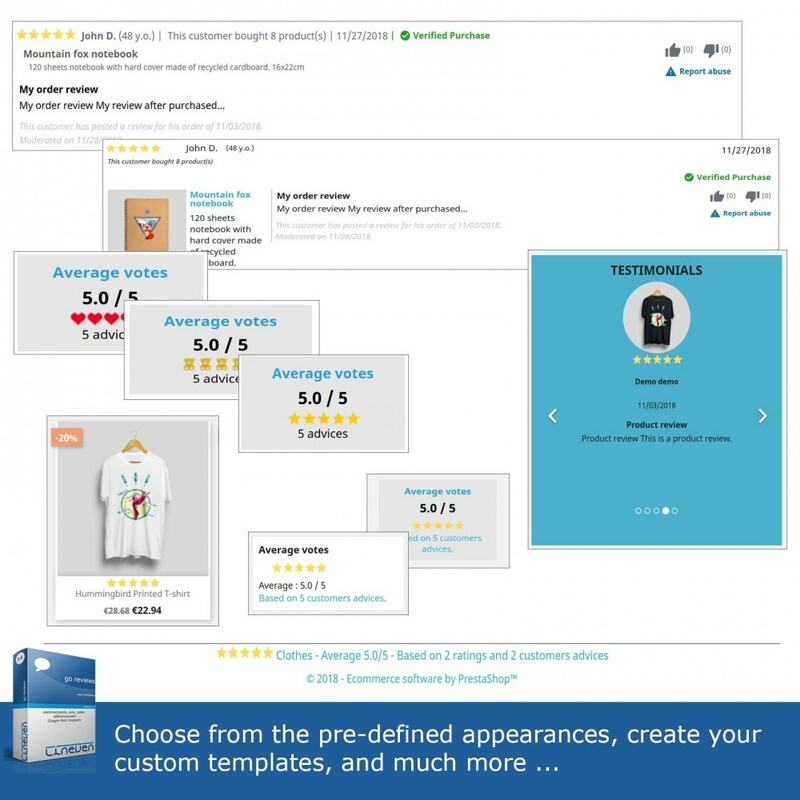 You also have the option to display the average rating of your store, but also the average rating for each product noted. You can also set discounts and offer them to customers who post an accepted and / or refused review. Allow your customers to post an image illustrating their comment. Display the "Verified Purchase" label for a review posted after for an order. Test the module with demo websites to learn about all the features available. Enable Google Rich Snippets and improve your results in the search engine Google and increase your click through rate, your number of visitors and your sales! 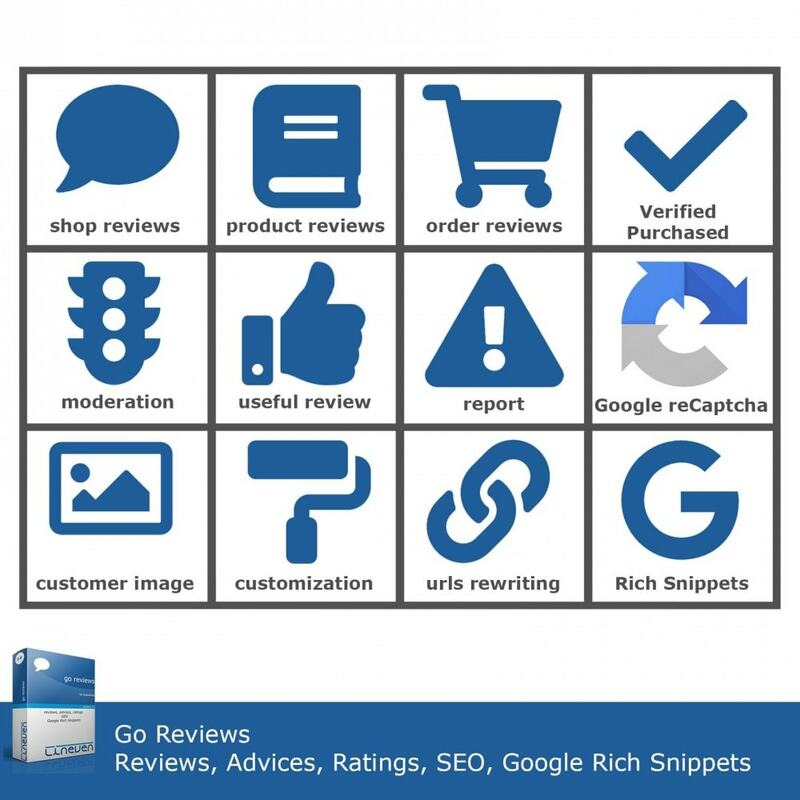 Note that your shop must be Google Rich Snippets compliant and the module provides the microdata for reviews in addition to the microdata on your store. The test tool Google Rich Snippet will not guarantee the display of the rating in the search results. Indeed, this tool only validate technically the microdatas. Google makes algorithmic determinations on when and how to display results in the SERPS (including snippet information) based on a myriad of factors including the search terms, etc. Even if they are coded correctly, snippet inclusion in the SERPS (search engine results page) is beyond our direct control. We would recommend focusing your efforts on making as unique and compelling a site as possible in order to increase the likelihood of your products reviews displaying in the Google search. For versions of Prestashop >= 1.5, enable the SEO mode (only if you enable URL rewriting) to improve SEO. 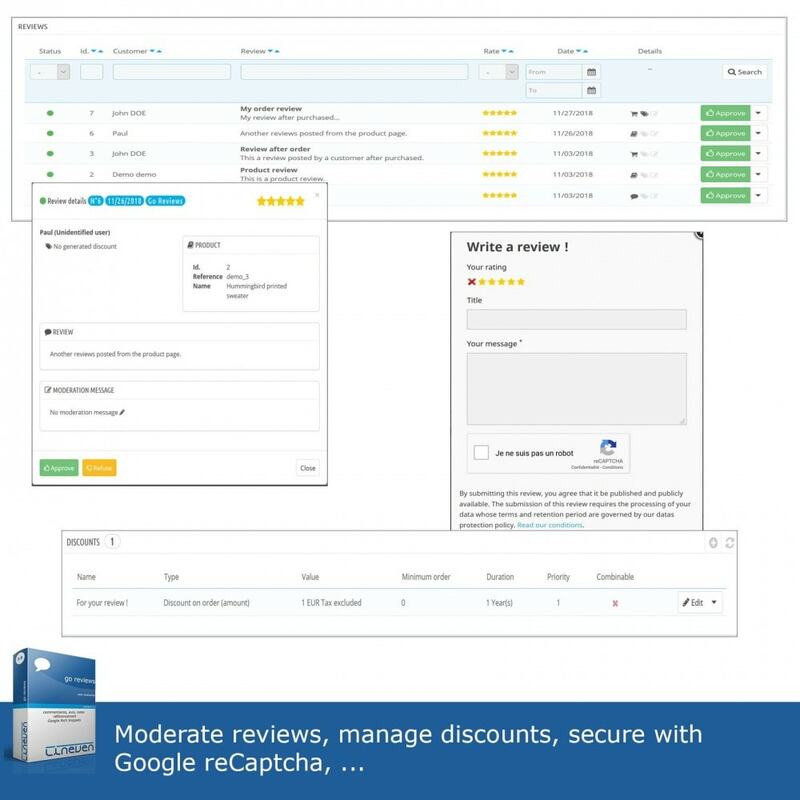 Enjoy the moderation interface to accept or reject customer reviews. View information related to the review posted. Add moderation comments that will appear on your shop. 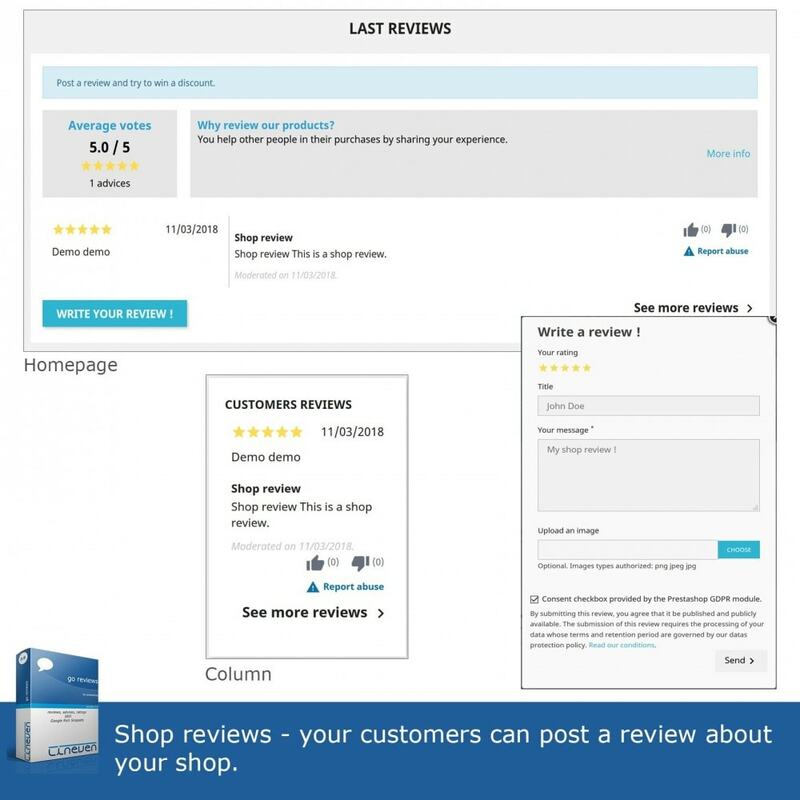 Encourage your customers to post a review when the command is defined "delivered" or "shipped". Your clients will also be notified when the advice will be accepted and / or denied. You have the ability to be alerted when a customer advice will be sent. - Possibility to enable reviews filtering by language (for reviews posted since version 3.1.0 of the module). The filtering by language allows to display reviews according to the chosen language and does not modify the calculated average on the basis of all the reviews (whatever the language). - You can put customer into a blacklist to do not generate vouchers or send emails. The module configuration is fairly extensive (many available settings), some items are more expensive than others in terms of treatment. The parameters that can requesting more resources are annotated in the backoffice. Warning : The growing amount of reviews can use most of the server resources. For a potential customer will make it much more reassuring to cross the act of purchase if it finds that other customers before him have done and do share. Your shop is located in France? Make your shop in compliance with decree N ° 2017-1436 in effet as of January 1, 2018. This decree n° 2017-1436 relating to the information obligations relating to online consumers reviews clarifies the term "online reviews" and the various methods allowing a certain regulation of these advices. The module provides features to help in your compliancy with the decree. However, it is your responsibility to activate them and to put in place all the necessary actions to ensure your compliance. 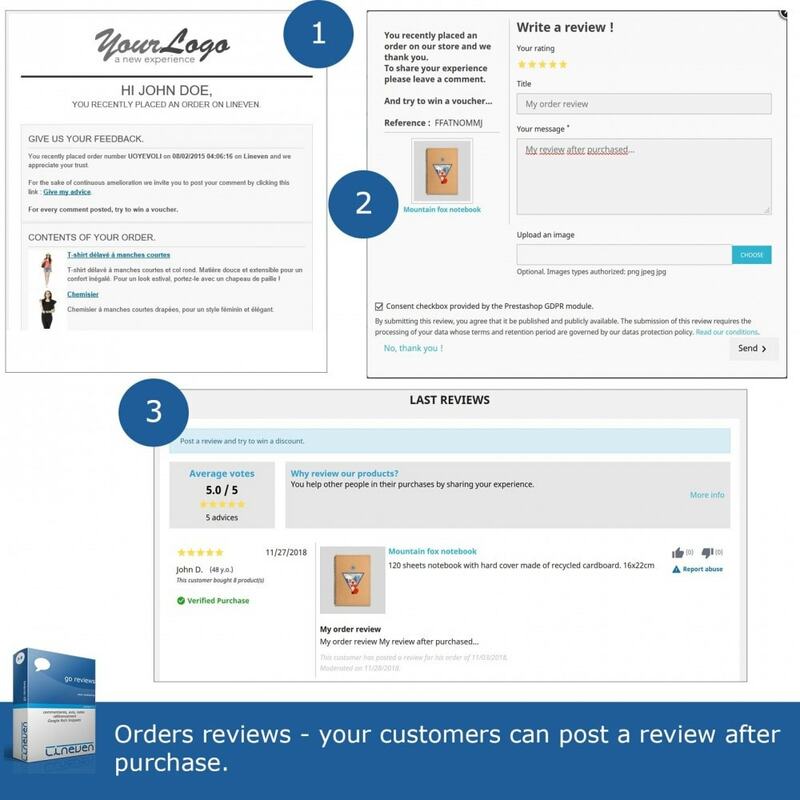 Orders reviews form : Customer image field and pseudo field displayed issue.